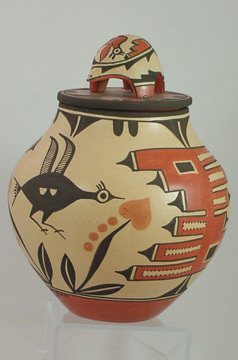 This is beautiful jar or olla that Elizabeth Medina of the Zia pueblo executes in masterful fashion. 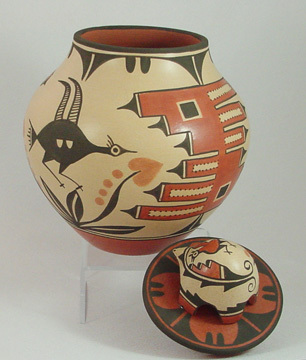 This jar measures 11 inches high (including lid) and 8 inches in diameter at its widest part. 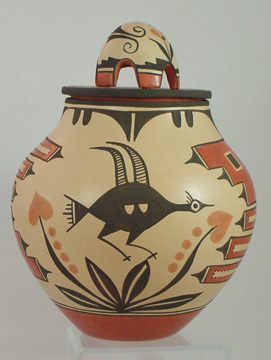 It is decorated with stylized versions of the Zia bird, or roadrunner along with sharply colored bands, clouds and floral arrangements. 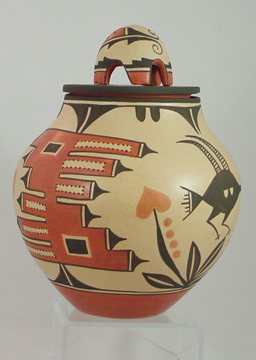 The decoration is simply elegant, arranged with a sharp eye for space along the surface of the pot. 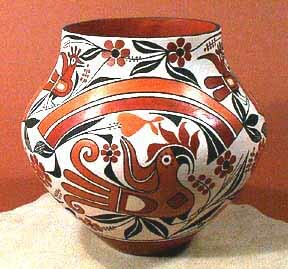 Note the stunning combination of traditional Zia designs with fine line work! All the elements to construct this wonderful piece were provided by Mother Earth. As Elizabeth says in Fourteen Families, basalt is used for temper after it is broken up by freezing temperatures at the side of the river.